It comes a point in every guitar player’s career when they feel like it’s time to switch to a new, more expensive guitar. However, as we get accustomed to our guitar’s weight, shape and fretboard, it can get increasingly harder to part ways with it. 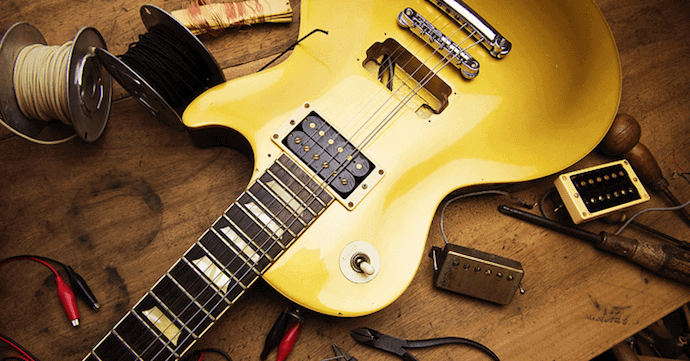 Upgrading your pickups is a simple, cost-efficient way to improve your sound quality without actually buying a new instrument. If you own a guitar with a P90 pickup, you know that its specific sound is very hard to achieve with any other pickup. It gives you the attack and the twang of a single coil, combined with the beefy mid-low range response, similar to that of a humbucker. And, with many different manufacturers offering a variety of P90s, it can be hard to make a decision as to which P90 pickup gives the most bang for your buck. To help you make that decision, I handpicked six P90 pickups that will give your guitar that distinctly warm sound. Let’s get into the P90 pickups that are worth taking a look at. What Are the Traditional Features of a P90? In the past 40 years of rock 'n' roll, we’ve come to learn that Seymour Duncan pretty much can do no wrong when making a pickup. You can find their pickups on Gibson, Fender, Ibanez, and many other top-tier guitars. In fact, David Gilmour’s 1952 Fender Esquire with Seymour Duncan pickups can be seen at the “Pink Floyd: Their Mortal Remains” exhibition in the V&A Museum in London. The Phat Cat seems to honor the rich Seymour Duncan tradition. It uses Alnico II magnets, which give you improved sustain and a softer attack. They have a great tonal clarity, which doesn’t go away even when you push the overdrive. The tough metal cover provides more shielding and noise reduction, which contributes to an even cleaner, tame sound. It’s almost impossible to talk about P90s without mentioning the original Gibson P90 pickup. Introduced in the late 40's, this pickup features the classic combination of clear sound and high output, which has been a favorite of many musicians through the years. It’s fully waxed to avoid microphonic feedback, and uses the Alnico V magnet which gives it a fattier tone compared to Alnico II. However, this doesn’t mean it’s too fat to sound like a true P90. On the contrary – the Gibson P90 achieves the warm vintage P90 sound effortlessly. This pickup is known for its fat mid-range. Unlike some other P90 pickups, Lindy Fralin is truly noiseless due to its reverse wound bridge which helps with hum canceling when both pickups are on. The sustain is solid, single notes thick, and the chords ring out with some compression, which makes for a clear sound. The Lindy Fralin P90 is made to the historic vintage Gibson specifications, and utilizes Butyrate P90 Bobbins, USA-Made Alnico IV Bar Magnets, and 42-Gauge Plain Enamel Wire, for that authentic vintage tone. Possibly the best thing about this pickup is that it’s available with Alnico IV magnets and steel poles. Alnico IV gives you a cleaner, sustained sound, while steel poles sound closer to the original P90 from the 50’s. Unlike the Lindy Fralin, which is a top-tier product, the DiMarzio Bluesbucker is a more affordable pickup. However, don’t be mistaken – this pickup doesn’t sacrifice quality, and packs quite a few interesting features that enable you to get the most out of your sound. It’s designed like a humbucker in terms of size and shape, but operates with single coils like a P90. The unique design features two single coils, one of which is a “hot” coil, while the other one has a role mainly in noise cancellation. This means that changing the order gives you two different sounds – placing the “hot” coil closer to the neck results in a warm sound, while putting it closer to the bridge produces a brighter sound. The Kent Armstrong P90 is different from all the other entries on this list in one major way – it features a double coil setup, rather than a single coil. This results in better hum canceling, while it has its downsides when it comes to the sound. It has a lower output than many P90s, which results in a less bright sound and a darkened high end. However, its crunchy, hard sound makes it a great option if you play more aggressive styles like hard rock or metal. Like the DiMarzio P90, it’s not considered a top-tier product, which makes it quite affordable. Seymour Duncan deserves another spot on this list with their modern twist on the vintage Gibson P90. Fitted with Alnico V magnets (the same as the original Gibson P90), this pickup provides a muddier tone, while keeping the tonal character of a P90. It has a higher output than many single coils and the signature midrange grittiness that makes the P90s so easily distinguishable. It has the traditional soap bar design, which means it can easily fit into the place of any classic P90 pickups. My favorite thing about the Seymour Duncan P90 is that it comes in matte black, which looks way sleeker than Gibson’s retro cream. All P90 pickups feature similar tone but they come in a variety of shapes. This is important, as not all guitars can be fitted with all of these pickups. If you have your eyes set on a particular P90, you have to make sure your guitar is ready for it. Soap bar – the original Gibson P90 with a rectangular shape. Mounting screws are in the middle of the pickup, so they don’t fix into your pickguard. Dog ear – similar to the soap bar design, the dog ear P90s also sport a rectangular shape. However, the mounting screws are not placed in the center of the pickup but on a triangular extension on each end of the pickup. This requires some modifications on many guitars, as these P90s will affix into your pickguard. 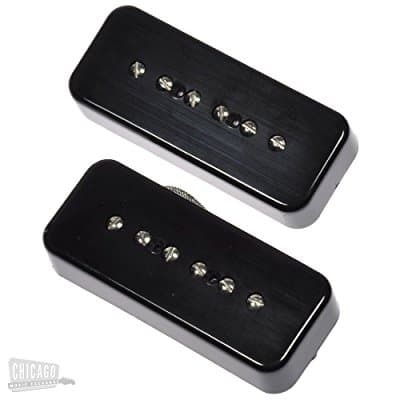 Humbucker casing – similar to a standard humbucker design, these P90s are a bit thinner and longer than a traditional humbucker. These pickups require no modifications on your guitar. A classic P90 pickup has a distinct sound that is almost impossible to confuse with any other pickups, even for an untrained ear (tele, or noiseless strat pickups, for example). Its attack is clearer and its tone brighter than a classic humbucker, while it has a muddier midrange response than a single coil. However, there are some differences between models – some of them have better noise canceling, while others sacrifice this for a stronger punch and clearer individual notes. Most of these differences come from different magnet materials. The most popular magnet types are Alnico (usually Alnico II and Alnico V) and ceramic. 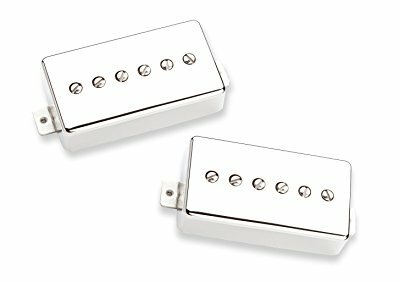 Alnico is usually used in high-end pickups, but since ceramic magnet pickups are cheaper, you can buy a pickup with a higher grade ceramic magnet for the same price. 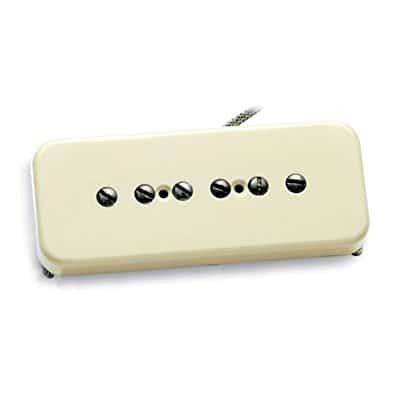 This results in ceramic magnet pickups often having a brighter, clearer tone. All of these six pickups have their own advantages and flaws, and each of them is the best possible choice for a certain guitar player. The most important thing when buying a P90 pickup is choosing the one that fits your guitar and playing style perfectly. Remember, trying them all out is the best way to see their differences. There is no shame in walking into a guitar shop, trying a guitar with a certain pickup, and walking out without buying anything. In fact, this will help you make an informed decision further down the road.